Indocyanine green chorioangiography (ICG) is a procedure which images a layer of the posterior part of the eye. This layer, the choroid, is deeper than the retina and normally obscured by pigmentation. The choroid contains a unique network of blood vessels. These blood vessels flow very fast and probably help to control the temperature of the eyeball in addition to carrying nutrients to the photoreceptors that convert light into vision. Unfortunately, these large, fast flowing vessels can be affected by disease and change as we age. Indocyanine dye is very special; it glows or “fluoresces” in the infrared spectrum. This means it can’t be seen with the naked eye as the test is done. It also means that when it is imaged, we can usually see through pigmentation, fluid, or blood in the back of the eye. 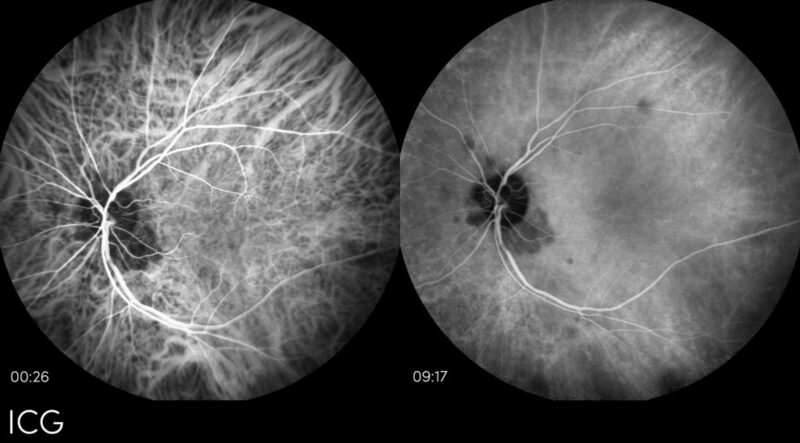 ICG angiography allows the doctor to evaluate the deeper choroidal blood vessels which can often be difficult to visualize with only the fluorescein dye.